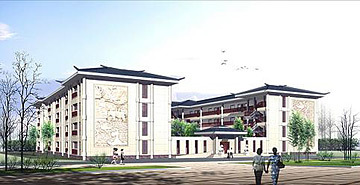 Architectural drawings show the proposed China-U.S. Center dorm at the University of Hawaii at Hilo. Plans also call for a conference center, a hotel and retail and office space. A long-anticipated project for privately built dorms and a retail, commercial and hotel complex at the University of Hawaii at Hilo has been delayed again after questions arose at a Board of Regents meeting. But UH-Hilo administrators and new developer Bridgecreek International Corp. said they were still optimistic a deal can be worked out soon. It's hoped that the center will provide 1,472 new dorm beds to help UH-Hilo attract students and that the commercial and conference center will become a place where students, staff and community members can shop, eat and do business. Bridgecreek, based in Huntington Beach, Calif., went before the Board of Regents on Thursday to ask the board to grant a lease for 36 acres of state land next to UH-Hilo. But questions arose about the project during the meeting. After a closed-door meeting with UH attorneys, acting UH President Linda Johnsrud said the administration needs to take a closer look at the project. Bridgecreek's request was supported by students and Big Island lawmakers, who flew to Oahu to express their support for the project. Ginger Takeshita, a housing coordinator at UH-Hilo, told the board that it is "disheartening" to show parents and perspective students the current dorm rooms. John Carlson, chief executive officer of Bridgecreek International, told the board that if the leases were granted on Thursday, it would still be possible to have the dorms ready for occupancy by fall 2007. But regents questioned a letter written by UH-Hilo interim vice chancellor for administrative affairs Bill Chen that offered to guarantee enough occupancy for the $74 million dorm project to pay back a construction loan. Regents were concerned about whether the university would have to pay back the loan or part of the loan if the project falls short of expectations. Regent Andres Albano Jr. noted that giving the developer the use of state land is already a significant contribution to the project and asked why the university needs to put up an additional cash guarantee. Board Chairwoman Kitty Lagareta publicly scolded the UH-Hilo administration for making the promise without consulting the UH president's office or the general counsel. Lagareta said regents only learned about the letter two days before the board meeting. Carlson told the board he has lined up financing through HSBC Bank and that his company is putting up to $13 million of its own money into the project. The guarantee of occupancy by the university is required by HSBC Bank as a condition of the loan, Carlson said. "We're building special purpose housing, which is not easy to rent to anyone," Carlson said after the meeting. "It's not the most profitable housing." HSBC is also meeting with Bank of Hawaii and Central Pacific Bank about sharing the cost of the project. Because of that, regents Allan Landon, chairman and chief executive officer of Bank of Hawaii, and Ron Migata, chairman of the board of Central Pacific Bank, recessed themselves from the discussion on the project. Regent Jane Tatibouet also raised questions about whether students would be able to afford to live in the dorms. Bridgecreek is proposing to charge about $5,850 for a shared room during the 10-month academic year and $8,500 for a single room in the new dorms. Carlson said the rents are comparable to currently available housing in Hilo. Current on-campus housing fees for the 620 beds at UH-Hilo range from $2,524 a person for a shared room per academic year in the Hale Kanilehua and Hale Kauanoe dorms to $4,580 a person for a one-bedroom apartment in the Hale 'Ikena apartments. Bridgecreek International stepped into the public/private project in January after Taiwan-based Geo International Explorer was unable to obtain financing or construction bonding for the project. Bridgecreek is using plans already drawn up by Geo to allow the project to proceed faster and Geo remains a minority partner in the venture. Plans to develop the university land have been talked about for more than eight years, when the project was originally called the "Vulcan Village." After Gov. Ben Cayetano's visit to Taiwan in 1998, a group of Taiwanese investors promised to finance the building of the dorms for the right to develop a conference center, hotel, and retail and office space on the 36-acre site. After the regents' meeting, UH-Hilo Chancellor Rose Tseng said she believes the board will eventually approve the project, which she said is needed to attract and retain students. "If we're going to build it (dorms) ourselves, it would cost more money," Tseng said. The chancellor said the letter offering to guarantee occupancy for the dorms was conditional and was approved by a private attorney hired by the university general counsel to help with the project. Tseng added that a guarantee of 60 percent occupancy is "conservative," considering the waiting list for dorm rooms at UH-Hilo. Carlson said Bridgecreek still wants to work with the university and answer any questions the university may have. He said the board appears to have confidence in the team he put together to build the project, including contractor Parsons Corp.
"We feel very encouraged and are looking forward to doing the project," Carlson said. He said the project has the support of the mayor and county council, and a grading permit already has been granted. Carlson said it probably will not be possible now to complete the dorm rooms in time for the start of the fall 2007 semester. But he said once the board approves the lease for the land, construction could start within days or weeks. Once completed, the China U.S. Center will become "the focal point of the entire county, not just for the campus," Carlson said.